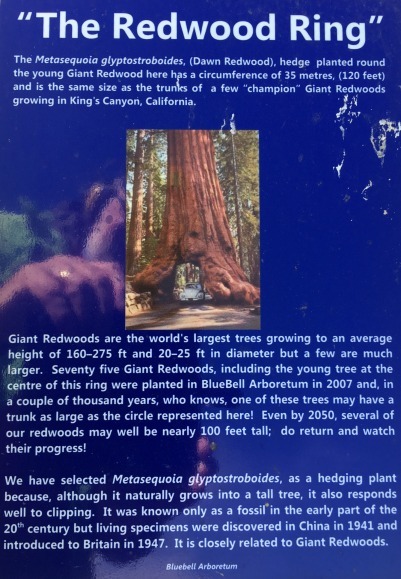 Robert wrote about his particular interest in redwoods; "We have 75 young (12 year old) Sequoiadendrons, a few 24 year old ones, several Sequoias and, I think, maybe the most comprehensive UK selection of Metasequoia cultivars growing in our educational arboretum where planting started on what was an arable field in 1992. I really enjoyed seeing pictures of the "redwood ring", how unusual and a great way of showing the size of the world's largest Sequoiadendron! The ring is clearly visible on Google Maps ariel views, which really illustrates the huge diameter of the largest Giant Redwood tree. Robert sent further interesting details regarding the beginnings of Bluebell Nursery and Arboretum. "I met my wife, Suzette at the Sir Harold Hillier Arboretum in 1970 when we were both horticultural students. We eventually started our own nursery locally on rented ground behind a pub called the Bluebell. Eventually, with significant support from Lloyds Bank, we bought 12 acres of arable land, six in 1992 & an adjoining six in 2004 near to the village of Smisby which is in Derbyshire, despite our Ashby de la Zouch postal address. We subsequently moved our rare tree nursery here and have created an educational arboretum, open to the public throughout the year except on Sunday's during winter, covering nine acres of this site. Our arboretum is now home to some of Britain's rarest trees, all relatively young in the great scheme of things, and will continue to flourish for the foreseeable future in the safe hands of our son, also Robert and his wife, Rachel, both trained horticulturalists as my wife and I retire from some of our more active rolls here! We've had a particular interest in redwoods for many years and have been able to indulge our interest here although, necessarily, all our redwoods are still barely adolescent in the great scheme of things. We planted our first, 4" high Sequoiadendron on 11th March 1992 to celebrate our land (& mortgage) acquisition; that tree is now approximately 50 feet tall. Subsequently we've planted over 75 giant redwoods, about 10 Sequoias (which flourish here, quickly developing splendid trunks but are unfortunately slightly prone to having their tops freeze dried during cold winters) & every Metasequoia cultivar which we've been able to acquire. 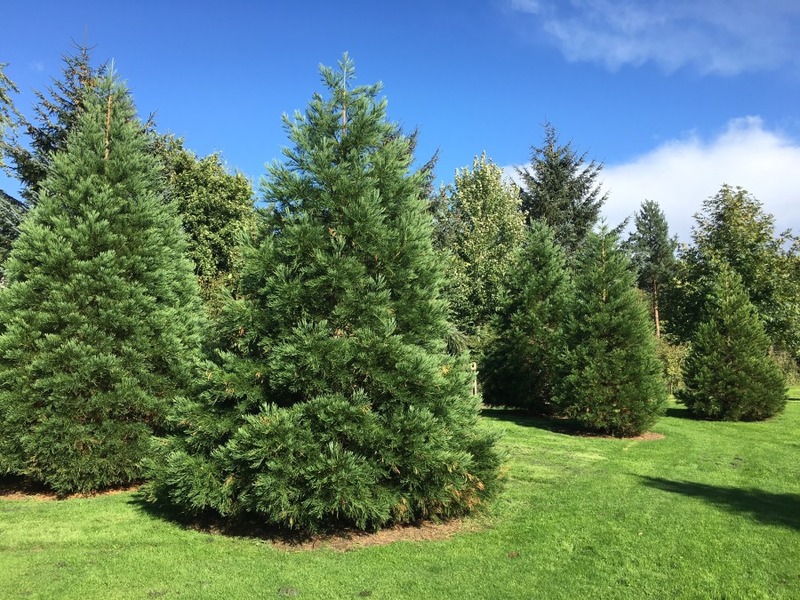 We have several interesting cultivars of Sequoiadendron, including weeping & blue varieties of course and, in particular, a fine specimen of Sequoiadendron giganteum 'Bultink Yellow' which has steel blue foliage during winter but lovely soft yellow especially foliage during early summer. 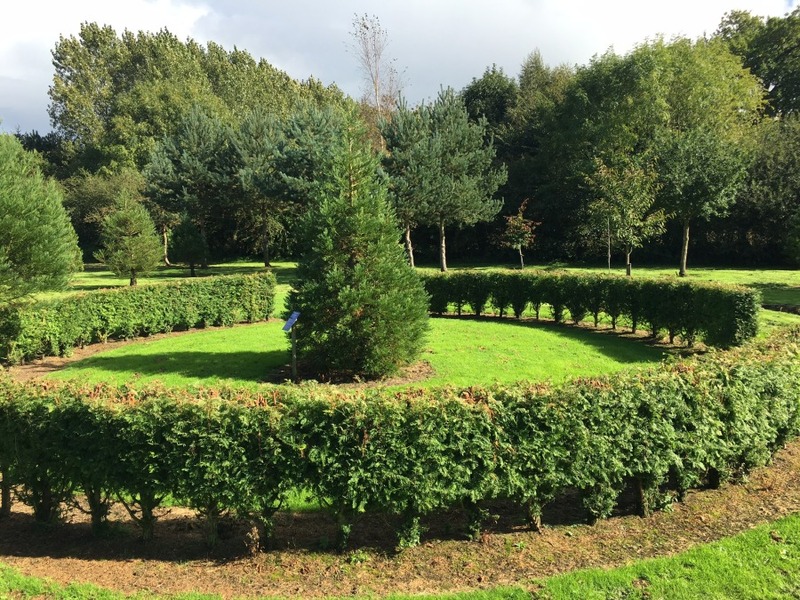 We've created a couple of especially interesting features, a "singing redwood" which we call Sequoia harmonica and our "redwood ring", a circular Metasequoia hedge around a Sequoiadendron, the circumference of which is the same as the largest redwood in Congress Grove, California. A great tale of a fantastic creation and legacy for future generations. I am lost for words in trying to show my admiration and envy for such a great achievement Robert. Follow this link for directions to the Bluebell Nursery and Arboretum in Smisby, Ashby de la Zouch.